Psoria® Psoriasis Cream with Tea Tree Oil, Aloe, Vitamin E, Borage Oil (GLA- Gamma Linolenic Acid) and Shea Butter will give you instant healing relief to dehydrated, flaky and itchy psoriatic skin. 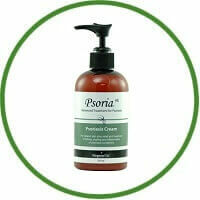 Psoria is an all natural antiseptic and anti-inflammatory cream. The cream has a base of Primrose and Sandalwood oil; together, they help improve tissue health along with relieving scaling and itching. Effective Aloe, Borage oil (GLA), Primrose, and Tea Tree oil are shown to reduce inflammation, improve skin tissue, decreasing dryness, reduce scaling, and speed up the skin tissue healing process. We all know that psoriasis is a skin disorder and it is triggered by some common factors, the natural ingredients in Psoria Psoriasis Cream have been proven to reduce the uncomfortable and embarrassing symptoms of psoriasis. Having healthy, manageable skin and being able to have the confidence to go out in public with your spouse, children or friends is what this psoriasis treatment was designed for. Try to get back on track to a healthy, productive, normal life style again!